One of the GAHP’s goals is to create an accessible and consistent database for recording cardiac related health information in all four great ape taxa. 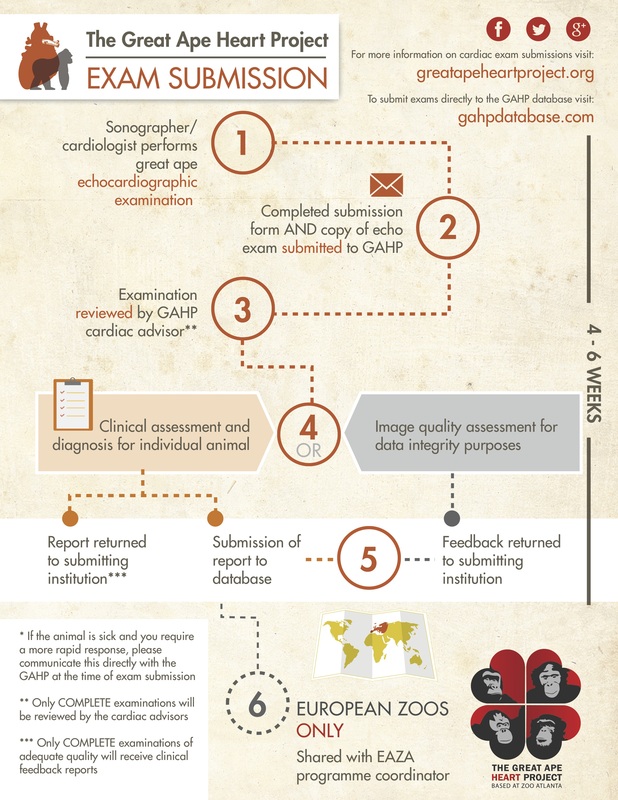 When your institution performs physical exams on apes in your collection, please fill out the GAHP Cardiac Database Form and submit it along with a copy of the ultrasound to the Great Ape Heart Project at Zoo Atlanta. The form is available as a pdf or as a Microsoft Word document for your convenience. It can either be submitted via email to gahpinfo@gmail.com or mailed to the address below. The GAHP database also includes postmortem findings. Please submit full necropsy reports to gahpinfo@gmail.com once they become available. In the event that an ape has died, please refer to the following cardiac necropsy protocols. These protocols are also available on the Members Only section of AAZV.org and are also available through each SSP. For the general great ape necropsy protocol, please refer to the Members Only section of AAZV.org.